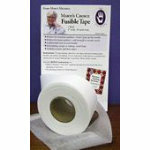 Other > Marti's Choice Fusible Tape 2"
1 roll 2" wide total 30 yards. 2" wide perfect for "wavy cut seams" Made from NonWoven material to prevent stretching and provide stability. White, very lightweight fusible material. Includes 10 page instruction pamphlet by Marti Michell. also includes bonus instructions for a nobinding finish for tablerunners or wallhangings. Will not gum up machine ndls Easy hand needling, use to easily join smaller batting pieces together.